Today two powerful, trail-blazing women face off as Sojourner Truth takes on Frances Joseph-Gaudet. In the first round, Sojourner made quick work of Soren Kierkegaard while Frances defeated John Mason Neale. The winner of this epic battle will face Absalom Jones in the Elate Eight. Let’s just state from the outset that, no, you can’t vote for both. And abstaining only makes you come off as indecisive. So, read, revel in their respective accomplishments, and then vote! Yesterday Vida Dutton Scudder upset Clare of Assisi 52% to 48%. Is Vida the first true Cinderella of Lent Madness 2016? Sojourner Truth was a preacher, activist, and all-around freedom fighter in the mid-19th century. Her famous “Ain’t I a Woman?” speech was given in Akron, Ohio in 1851. It was extemporaneous, because she couldn’t read or write, and contemporary accounts vary wildly. “I can’t read, but I can hear. I have heard the Bible and have learned that Eve caused man to sin. Well, if woman upset the world, do give her a chance to set it right side up again.” The phrase “ain’t I a woman?” never appeared in accounts of what she said until years later. That phrase appears to have sprung from the pens of the White journalists who were playing on popular assumptions of how Southern, uneducated slaves spoke. However, Sojourner herself grew up speaking exclusively Dutch in New York. From all other accounts of her speaking, she spoke impeccable English with no Southern accent, so she more than likely never used that particular phrase. She was an incredibly popular preacher. She spoke on her unique biblical interpretations based on her life experiences–something most White audiences had never heard. “Children, who made your skin white? Was it not God? Who made mine black? Was it not the same God? Am I to blame, therefore, because my skin is black? Does it not cast a reproach on our Maker to despise a part of His children, because He has been pleased to give them a black skin? Indeed, children, it does; and your teachers ought to tell you so, and root up, if possible, the great sin of prejudice against color from your minds…. Buoyed by a prophetic voice, and a healthy sprinkling of humor, Sojourner spoke truth to power throughout the country at a pivotal time in history. CONGRATULATIONS! You have won an all expense cyber-tour of the life and times of Frances Joseph-Gaudet: educator, activist, and reformer. On your cyber-tour, you will have an all-inclusive experience at locations across the globe. Day 1: You will travel to a log cabin in Holmesville, MS where you will experience where Frances was born to a Native American mother, and an indentured slave for a father. Day 2: From Mississippi, you will travel to New Orleans, LA to see Frances’ next home with her grandparents. We will take a tour of the site of Straight College where Frances attended university on beautiful Canal Street in New Orleans. While downtown, we will mosey on over to St. Luke’s Episcopal Church to enjoy the beauty of this worship space that houses a stained glass of Frances, and where the parish hall is dedicated in her honor. St. Luke’s is Frances’ national shrine. From St. Luke’s we will take a tour of the Episcopal Diocese of Louisiana where your church can apply for the “Gaudet Community Grant” for community endeavors that creates educational opportunities for African American children. Frances’ gift of education continues to give to this day. Day 3: We will hop on a PLANE for Scotland! Yes, you will get to go to Scotland to experience the Women’s Christian Temperance Union convention in Edinburgh where Frances assumed responsibility for young blacks convicted of misdemeanor and vagrancy. We will continue our trip abroad through London, Paris, and Belfast as Frances continues her global advocacy. Day 4: We will return to Louisiana where we will tour the Gaudet Normal and Industrial School, now known as the Gaudet Episcopal Home for orphans. While the home is no longer in active use, you can still apply for scholarships and other endowments through Frances’ generosity. If time permits, we will tour the 22 prisons that Frances visited in her life. Day 5: From Louisiana, we will head to Middletown, RI to see Gaudet Middle School, the middle school attended by this blogger as proof that God has divine plans and intersections. Frances was a part of my life before I knew it. You will experience poverty, international travel, education, incarceration and adoption on this journey of Frances Joseph-Gaudet. You will not be bored. 112 Comments to "Sojourner Truth vs. Frances Joseph-Gaudet"
I voted for Frances because she let kids into her house. thank you once again Oliver for your acute sense of what’s important. I voted for Frances for the same reason, Oliver. Good reasoning, Oliver! However, this was a tough choice for me. Me too Oliver. She cared for kids. Today we agree but it was a HARD choice. Both were wonderful women. Yes, her hospitality knew no limits. She is an inspiration for sure. I be you’ll be the same way! Both of these women are awesome in their efforts on behalf of humankind. I spent much of yesterday praying for this group. I have learned so much reading about all of these “candidates.” I thank you all for your thoughts and comments as we ride together toward “Canterbury.” What amazing forebears in faith we have. I’ll look forward to today’s comments. All of you, have a blessed day. Thank you for your payers, St. Celia. Your words inspired me to say a prayer for the group as well. Think how many prayers, if each of us pray for the group and the world each day after we cast our vote. Oh noes! Looking at the remaining brackets I have the horrible feeling it will be Sojourner against Constance! Yikes! What a horrible choice to have to make. Yes, the voting has been so skewed toward social activists that only Julian of Norwich remains to represent for the mystics/contemplatives. Hmm, or the social activist just have such compelling stories. In the case of both Constance and Sojourner, I’m not sure if you could get much more heart wrenching stories of Christian faith and endurance. I’m going with Julian of Norwich. We re Christians, not Christian Social Workers – we are nothing without mysery. Im a Christian social worker with the heart of a mystic…so many hard choices! Ms Truth shall set you free; awesome Sojourner. This was a really tough one. Both were truly amazing women whose legacies live on. How to choose between them. Finally, I decided to vote for Sojourner because of her sense of humor about the suffragettes fashions. No kidding. In my original bracket I chose Truth, but I reread the information this morning and I think how did I put Truth ahead of Frances that day. They are both incredibly amazing women and did so so much to change the world. I too think it was the comments about fashion which sadly I think is still a huge problem today. I mean really why do women still wear high heel shoes ruining their feet endangering their health??? It is a mystery to me why women wear these objects of torture. All things in moderation! While I would never consider myself a slave to fashion, I think it’s fun to dress up! Love me a pretty pair of heels and a hat on Sundays, I do! Sojo lived in my town Florence, MA. Proud haven and stop on Underground railroad. We have a big ol staue of her here! Very hard choice! Finally went with Truth due to her sense of humour and the fact that she did all that years before Frances when prejudice was even greater. Both women are amazing vessels of God’s grace. Both fought for civil rights for black Americans and both were deeply involved in ministry to those in prison. Like you, Deacon Carol, I checked the chronologies and gave my vote to Sojourner because she did it first. Plus she was a great preacher! Michelle C., me too. Sojourner’s humor in the midst of serious things is refreshing, redemptive, and remarkable! Plus–I love the word “soujourn” so I had to vote for this woman! Truth be told, even today about God’s children. I’m glad that I don’t have to wear are those torturous sounding things to be in fashion. Then again, who cares for fashion? Don’t think I have a word for what passes for fashion these days. I voted for Frances although it was a hard choice. Because she lives at a later time she had a few more or actually made a few more opportunities to make a significant difference in the everyday lives of poor black children. She is for me a an example of what we can actually accomplish if we but follow the path god has given to us. The powerful and hounourous words of Sojourner Truth won my vote today. How wonderful to be a part of the whole company of heaven with these two amazing women. Amen, Fiona! I think they both make God smile. I have a special place in my heart for people who visit prisons. Once upon a time my job was the head of a short term women’s detention center for our city. People who came to visit were blessings I will never forget. Today’s bloggers are at the top of their game with new and updated info.Of major interest was new data about Sojourner Truth as to what was added/surmised and what was actually TRUTH. That she spoke Dutch as a native language was really fascinating and took some of the edge off the long-lived belief that she was totally illiterate. She changed the world with all that she did have in conjunction with leading abolitionists. Blog on, me hearties! I’ve loved Sojourner Truth ever since I read about her in the nascent Women’s Studies program at my university in 1970. I’m shocked to read that “Ain’t I a Woman” was a fabrication. Wow. As I read her bio today, I perceive her to be even more amazing than I thought at the time. Frances was equally amazing. Both women were led by the Spirit and accomplished great things. In the end, I vote for Frances because it was a great travelogue and I love to travel. To be very clear, the phrase itself was a fabrication; her speech was not. In fact, if you look up the whole speech, it’s both funny and devastating in the best ways. Sojourner Truth speaking so plainly to the children spoke to me today. My vote today is for her. Next year I am doing the bracket, for sure. My picks are not always the ones chosen, but it is clear at almost every vote who the winners will be. After playing this for three seasons, I am ready to go pro! Keep up the good work, and thank you for helping me with my sanity by reminding me early to relax because all of the competitors are already saints! I often find it difficult to decide whom to vote for, but predicting who will win each round is usually quite easy. Another tough one. I voted for Truth because I like her combination of wisdom and wit. Deeply attached to NOLA and Frances’ devotion to one of the corporal works of mercy, but in the end I voted for Sojourner for her ability to convict consciences without the benefit of literacy. Her use of the word “flummeries” in near conjunction with “panniers and Grecian bend-backs” (had to look up the latter of those but realized that it’s pretty well explained by the rest of the sentence–what we in the language game call a “gloss.” Once again, a brilliant, provocative match-up! There’s a hive mind as well as an SEC at work in Lent Madness! Toughest choice to date. Both speak to me profoundly. Was hoping that others’ comments would help me decide. No such luck. In the end I voted for Frances because treatment of children and prisoners are so much on my mind right now. There can be no wrong votes in this match-up. My vote went to Sojourner Truth for her sense of humor, because she spoke Dutch as her first language but also did flawless English, and because I just plain admire her so much. How can I choose between these two. I voted for each of them in the previous round. I suppose I will have to vote for Frances because I, too, have lived in Middletown, RI a couple of times (Navy wife) and my oldest daughter and my son both attended Gaudet Middle School. One could not go wrong with either Saint. I have reasons to vote for both but I chose Truth because I love the fact she could speak without notes and other attributes. I’m glad to learn even more about two inspiring women of whom I knew virtually nothing before LM. The travelogue was a clever device to present the case for Frances. I voted for Sojourner today because of the many ways she found to talk about God when making her case. She was actually pleading God’s case to those in power–without the benefit of notes! Suffering during Lent in not unusual but some of these choices are of the worst type of suffering. Both women are so wonderful. Aside from all that she did as a freedom fighter, activist and preacher, I find the fact that she spoke impeccable English a real plus. No “Ain’t I a Woman?” How about “Am I Not a Woman!” Go Sojourner! Free us with the truth. Oh my God! I don’t remember so many hard choices last year. Do I vote for Frances because she was an Episcopalian? Do I vote for Sojourner for her humor? A flip of a coin results in . . . Sojourner! Next up she will face Absalom! What will I do? Voting for Sojourner because there is a Presbyterian Church in my home town named in honor of her. This was a very difficult choice, as both women are real examples of Christian leadership. I liked them both, connecting with Sojourner’s comments on skin color and all being of God, as well as all the work that Frances did, which puts most of us to shame. I ended up voting for Frances because of her successful work. I was all for Sojourner until I read your bios. My mother was president of the local Women’s Christian Temperance Union, which was her passion. I was born in Rhode Island and later lived in Louisiana, so your travels with Frances took me through much of my life. As always, two great saints, but I go for Frances. One of the all time toughest choices of Lent Madness today. … However, with the continuing helpful SEC admonishments on the theme of ‘revel in their respective accomplishments’, I’m getting better at this. Instead of getting all tangled up in the angst of trying to determine which was the most ‘worthy’, I started from the acceptance that both are and watched for some little thing that touched my heart. The trip to follow Frances’ life was so clever and inspiring, she got my vote. Voting for Frances today. And terrific writing, Anna. I love your style. Tough choices, but Soujourne’s noble ability to speak “truth” about the sad and deplorable sin of prejudice wins the vote. Thank you for correcting the record with the fact that Sojourner Truth spoke impeccable English–the phrase attributed to her never sounded real to me from such a thinker and speaker. My vote today goes to Frances, however. She brought the comfort, challenge and wisdom of our faith to those in prison, souls we are all admonished to visit and remember. She shepherded Black youth from the imminent danger of a life in the system to productive education instead. Now, when education is knows to be the best way to end the criminalizing of youth, we need to be inspired by and learn from her amazing work! Difficult decision today with two compelling stories. Just wanted to set the record straight on the name of the middle school in Middletown. Gaudet Middle School was named for Joseph H Gaudet, a dedicated and long-serving superintendent of schools for the town. Though they are both amazing women, I have to stand by my Mississippi girl once again. Putting them both in their context of time and place, Truth joined various groups fighting for the causes of the day, while Gaudet quietly took up the cause of the forgotten. While I’m sure she had some help and eventually garnered international support, as a mixed-race, single mother in the South, her personal accomplishments strike me as nothing short of astonishing. And as saintliness goes, Truth was a slave and a woman fighting for her own rights as well as others, but, as near as I can tell, Gaudet was never a prisoner or a juvenile delinquent … making her efforts just a little bit more selfless. Although I thought Anna’s write up was creative and unique (excellent job Anna), I had to vote for Sojourner. All the way to the Golden Halo!! Yes all the way to the Golden Halo!!! Sojourner in another landslide, and I’m a pebble in that landslide. I like the tone of her quotes. I’m also struck by the fact that the argument that God made her black and we should not despise God’s work, is also used these days by gays and lesbians. Truly prophetic. This one was so hard for me that I ended up flipping a coin — literally — a first for me in Lent Madness. Both so wonderful and worthy. Frances won the coin flip and so got my vote. But I’ll also be happy if Sojourner wins, as seems likely from the vote at present. I could not decide. I had to flip a coin. Two great women. Glad to learn more truth about the eloquent Sojourner. Another very difficult choice between two remarkable activist women. I voted for Sojourner for many reasons, not least because of her broad influence on social awareness in her time. Also, I love the fact that education is not necessarily a prerequisite for eloquence. 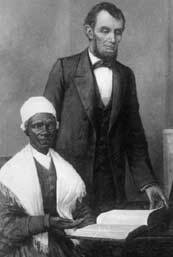 I find a monumental quality in Sojourner Truth that puts her among the really great saints throughout history. I wouldn’t have expected that at first, but as I read and reread her bios it gradually came over me that she is truly a figure for the ages. I voted for Sojourner because she fought against slavery and supported women’s rights two things which I feel are vitally important. This is not to say that Frances isn’t a great choice either. …”for in Heaven black and white are one in the love of Jesus”… speaking Truth to power! Slavery and it’s still-present legacy in racism are America’s “original sin”. Sojourner’s words and life cut across the decades and centuries – we need them as much today as when she bravely spoke them the first time. Oh my! What splendid saints God and the SEC have given us today! I voted for Sojourner because she was totally heroic and clearly a genius and her preaching was so filled with truth that still echoes for us today. How I wish someone had been able to record her sermons back then! And that she spoke impeccable English despite being illiterate, and Dutch as well, the language of my ancestors still being spoken in Sojourner’s youth in New York–wow! And besides, it’s my little “vengeance” to vote for Sojourner, since the admittedly very wonderful Frances had in the earlier round vanquished one of my all-time favorite saints, John Mason Neale, whose hymn translations I look forward so much to singing during Holy Week and Easter: “All glory, laud and honor to thee, Redeemer King!” I am sure both Sojourner and Frances will be joining us in the singing. This was very, very, very, very, very, hard to decide. To amazing women with admirable qualities and courage beyond measure, living in difficult times and making a major difference. I promised myself that I would vote for Sojourner Truth next year. P.S. I had to put my husband’s e-mail address in, since the computer wouldn’t except mine of: i.smite@verizon.net. Shame on you for putting the two black women up against each other! Shame! I loved the travels of Frances so voted for her!!! Very happy to cast my vote for Sojourner Truth today. Great write-ups, CBs! Anna, your pitch for Frances was tremendously creative! So tough today. Such beautifully and creatively written pieces on each. However, I am voting for Frances today, because I fear it is my last chance. I think I will have the opportunity to “lift up” Sojourner one more time. 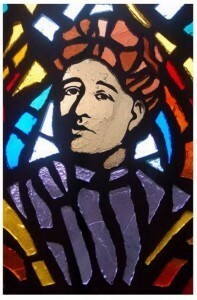 Also, there is something arresting and transfixing about Frances’ stained glass portrait. I feel calm just gazing at her. Interesting that the actual wording of the speech is no longer known. We have a number of quotations of a failry well known religious figure of the first century, and most of his actual words are no longer known. The accounts of his comments were written decades after the events, and in many instances, the accounts report events when (if one take the report seriously) no one was actually present. One account, written more than half a century later, has whole chapters of quotes of that noted figure, without interruption. Plainly, those words are not at all likely to be the actual words of that noted figure. And yet, we often read them as if they were. The reason is fairly clear (leaving aside appeals to magic): The folks who wrote those accounts were giving the best accounts they possibly could of that person, and history has pretty much judged them to have done a pretty good job. I see absolutely no reason to look askance at the comment “Ain’t I a woman?” Indeed, I have had the privilege of knowing a number of co-workers, any one of whom could easily have spoken that phrase without the slightest trace of irony or condescension. It’s true; it’s prophetic in the very best sense of the word. That’s why those people heard it even if she perhaps might not have said it. Alice Walker got it just right ( to me anyway ) in her public reading of Sojourner’s ” Ain’t I A Woman, talk in Ohio in 1851 that shocked and electrified the crowed. Sojourner could not read or write and her first language was Dutch, she certainly did not speak ” The King’s English,” She was filled with the Spirit and spoke the truth to power out of her deep and profound grasp of truth and her personal courage. I read a book about Sojourner Truth when I was in about 4th grade. She has always been an hero for me even if she didn’t make the particular speech attributed to her. Presidential choices are usually as difficult for me — but because I don’t really want to vote for EITHER of them! I vote for Sojourner Truth for her wit, wisdom, and the timelessness of her message today–no matter which particular sin we think we are battling. I was sure that Sojourner would have my vote, but Frances won me over with all she did for children and her enduring legacy. My heart votes for both. The voting is not over yet! Frances for me today. She had a double whammy against her: American Indian and black heritage. Yet look at all she accomplished through love and with the help of her Heavenly Father. It is not faith vs works, but works because of deep faith. Sojourner sojourned here in the US…. Frances spoke to the world. I voted for Sojourner …. so grateful for those who tried to right the wrong of slavery in the midst of it. What courage and faith that must have taken. Anyone who worked against slavery, the death penalty while also seeking prison reform, and establishing equal rights for all Americans has my vote. Spoiler alert: We are pitting Sojourner against Absalom — two of my favorites. I am a native Louisianian. However, I voted for Sojourner — again! I feel very deeply that were it not for Sojourner and her compatriots who so bravely fought and spoke against slavery, that Frances-Joseph would not have been born to a Native American mother and African American Indentured Servant, but into slavery. By that name, slavery. How different Frances’ life would have been in that circumstance. And then her journey to New Orleans to live with her grandparents and attend school there? Never would that have happened during the horrid years of slavery. So, I vote Sojourner and praise her courage and her works in making Frances-Joseph’s life possible. I see Frances as a “product” of Sojourner’s labors! Still have to vote local! This Mississippian is proud of Frances. Sojourner Truth for her confidence, speaking ability, dislike of fancy clothes and simple faith in knowing the way. Thank you to Megan Castellan for the excellent write-up on Sojourner Truth. I went into this thinking I’d vote for Frances, but you really brought out Sojourner’s personality. I saw her with new eyes today and heard her voice for the first time. My vote goes to her. “…white children must know that if they go to Heaven, they must go there without their prejudice against color, for in Heaven black and white are one in the love of Jesus.” Amen. I had to vote for Sojourner Truth, the “local girl” who made good. She lived in Ulster County, across the Hudson River from us, and for a while I worked in the Sojourner Truth Library at SUNY-New Paltz. A very tough choice today — want to vote for both! All I can do is to be thankful for the lives of both of these amazing women. Also thankful for the beautifully written summaries bringing each of them to life for us. Will be thinking a bit longer about this before making a choice. Oh OH SEC! I might of just voted twice! Well, I think I did, I thought I had voted this morning on my phone, but then I came to my laptop and it told me to vote. So I did. And then I felt guilty so …let it be a poor memory and not some techno glitch in which I will forever languish. Leaping flames of code and machine language: save me from these perils and welcome me back into the folds of tech savvy cyber citizens. I voted for Frances, who recognized that bringing education to poor children would help them to change their lives. She lived what she believed and her work is a lasting legacy. I wanted to vote for Sojourner because I have admired her ever since I was a kid (which was a long time ago). I thought her “Ain’t I a Woman” speech was riveting as reported – the vernacular of the reporting may have been artificial but the cadences were striking. But then I had to go with Frances because the issue of over-incarceration of young black men is something we still struggle with. What an ungodly choice to have to make. Tough choice. Sojourner. “… for in Heaven black and white are one in the love of Jesus.” That tipped the scales for me. I too have admired her since I was very young.